Worship Services at 1:00 & 7:00PM as well. NO SATURDAY SERVICE - APRIL 20TH! Holy Communion offered at both services. Sunday school begins 3rd Sunday of September and ends 3rd Sunday of May. 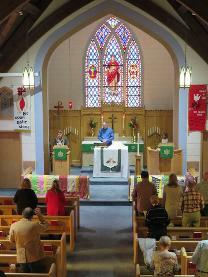 Thank you for your interest in First Lutheran Church. We strive to provide quality worship in a relaxed setting so that members and visitors can have time and space to take a break from your hectic lives, reconnect with God, and find renewed meaning and joy in your life. of the life the faith communities and their challenges throughout the world.